Scotland | What's (in) the Picture? Wishing to be a decent enough golf player to finish the 18th hole, and maybe seeing a deer! What’s (in) the picture? Wish: Should I Stay Or Should I Go? This weekly theme is ‘dinnertime’. Photo ni Ompong Six Word Story: Eat the Dead! la floralie 2 240 Barbeque au Natural . Something from the Yucca Grill? Or the Found Wood Stove? la floralie 2 239 Sunday Brunch . Backs to the sun, Daffodils gather their curiousity for a meal from below. The 3rd Drawer Down DP WPC: Dinnertime! The Eye of a Thieving Magpie And Then Dinner Wandered By. Ouch!! My back hurts!! Dinnertime! A new year is the moment for a lot of people to make resolutions. There are 364 other days in the year to start something new, so why is January 1st so popular? Each day is an opportunity and I decided to start to clean up some photos lying around from last year. They are in my archive for a while waiting for publication: some did not have a subject, others were left out. This is the second post in a short series to empty my virtual desk. In May 2014 I visited Scotland for the first time. And what a pleasant visit that was. A beautiful landscape, superb food in a superb hotel and the best company of friends one can ask for at Gleneagles. 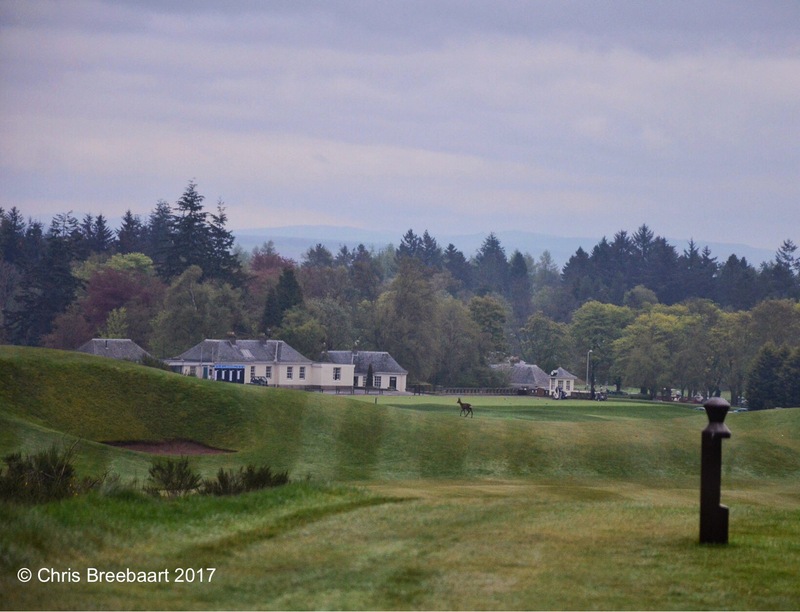 I do not play golf unfortunately, but being the photographer of duty on the King’s Course was an overwhelming experience. Here are some ‘leftovers’. The theme for the Weekly Photo Challenge is ‘yellow’. The light in the beautiful room of the hotel Gleneagles. This week the weekly challenge is ‘achievement’. In sports achievements are most of the time linked to winning or getting a good result. Here is a build up to such a win. The approach to the green of the 18th hole of the King’s Course at Gleneagles. The next stroke was a long winning put. This weekly photo challenge is about ‘descent’. Gleneagles King’s Course is a work of art. I had the pleasure to walk it and take pictures while friends were playing it. It was absolutely stunning to see the beauty and surprises of the design of the course. Absolutely beautiful. Lots of climbs and lots of descents to conquer to approach the pin. This weekly photo challenge is about ‘dialogue’. Put two photos next to another in such a way that an exchange between the pictures creates more meaning then an individual presentation. Well, here the fun starts. Communication between photos, just as the real world, is subjective. So I welcome you all to discover what the talk might be about between these two pictures! One is taken in Edinburgh, the other in Alkmaar. The latter one is a bit tilted but that is a link between the two photos as a starter. This weekly photo challenge is ‘texture’. A street in Edinburgh.